"It is a simple equation," writes Terry Tempest Williams, "place + people = politics." Nowhere is this more apparent than in the American West, where millions of acres of wilderness are at stake in the redrock desert of southern Utah. "How are we to find our way toward conversation?" she asks. One story at a time." 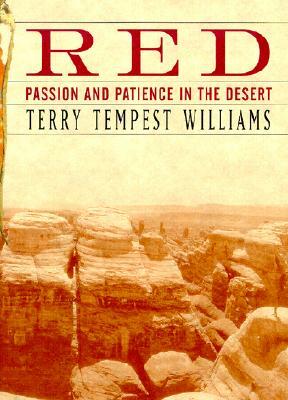 Red" traces Williams's lifelong love of and commitment to the desert, as she explores what draws us to a place and keeps us there. It brings together the lyrical evocations of Coyote's Canyon and Desert Quartet with new essays of great power and originality, essays that range from a family discussion on the desert tortoise to an investigation of slowness to startling encounters with Anasazi artifacts (including a ceremonial sash made of scarlet macaw feathers). Pursuing the question of why America's redrock wilderness matters to the soul of this country, "Red" bridges the divide between the political and the poetic and shows how this harshest and most fragile of landscapes inspires a soulful return to "wild mercy." The preservation of wildness is not simply a political process but a spiritual one. With grace, humor, and the subtleties of her perception, Williams reminds us of what we have forgotten in the chaos of our lives and what can be reclaimed in the stillness of the desert. Red" is further proof that the writings of Terry Tempest Williams possess a revelatory power and an emotional intelligence at once rare and authentic.